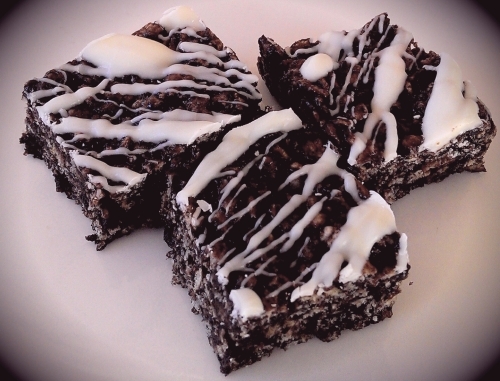 Oreo Krispie Treats require no baking and they are easy to make. This variation of Rice Krispie Treats (the classic no-bake cookies that are made from crisp rice cereal), the treats combine both chocolate crème cookies and cereal, making them a favorite cookie recipe for kids. The dark chocolate from the Oreos contrasts with white chocolate drizzle, allowing the treats to stand out on a platter of cookies. The treats are also great in lunch boxes and as an after-school snack. Lightly grease a 13 x 9 baking pan. Using a food processor with a steel blade, crush the chocolate sandwich cookies until fine. Slice cream cheese into the food processor bowl. Pulse the cream cheese with cookie crumbs until the ingredients are well combined. The mixture will be thick. Set it aside. Set butter in a large pan or Dutch oven over low heat. Once butter is melted, add the marshmallows. Use a wooden spoon to stir the mixture continually until the marshmallows are combined with the butter, melted and smooth. Add the chocolate cookie crumb mixture to the pan. Stir until smooth. Remove the pan from the heat. Stir the rice cereal into the mixture until all kernels are coated. Pour the mixture into the prepared pan and press it out evenly. Allow the bars to cool completely. Place the melting chocolate or chocolate chips in a microwave-safe bowl. Heat the chocolate at 50% power for 30 second increments, stirring it with a spatula in between cooking, until melted and smooth. Drizzle the melted chocolate over bars. Use a spoon to drizzle the chocolate directly onto the cookies. Or spoon the chocolate into a zip top bag, clip the corner, and squeezing it in more controlled patterns onto the cookie surface. Allow bars to cool and drizzled chocolate to set. Cut into bars. Store in an airtight container. The cereal mixture for Oreo Krispie Treats, as for other cereal bars, can be sticky. Use a piece of waxed paper to press the mixture into the pan evenly with your hand so it doesn’t adhere to the wooden spoon or spatula. Easy chocolate chip cookies - just 5 ingredients!